Welcome to the Outdoor Play Party! We can’t wait to see how you have been playing outside lately. Around here we’ve been spending some time down at the beach. The other day we took a bike ride down to a quiet little spot. Isn’t it wonderful when you find a little peace in the middle of all the mayhem? 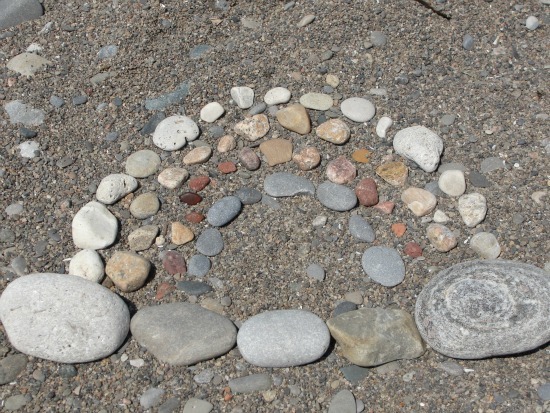 As we sat poking our feet into the sand and rocks we were inspired to make our own rock rainbow. My youngest daughter got to work searching for the different coloured rocks…although truthfully, I think I enjoyed this activity more than the girls. Sometimes that happens. We’ll start something as a group and the next thing I know I’m the one creating a rainbow out of rocks. However it happened, we made a lovely treat for anyone out on a walk on the beach. We love leaving art behind. 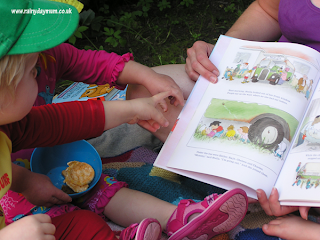 I loved seeing Rainy Day Mum outside reading, to a big group of little ones, under the shade of a tree. 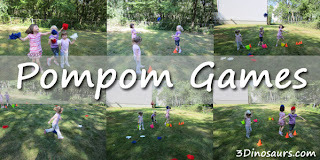 Check out how many ways the kids over at 3 Dinosaurs played with homemade pom-poms! So many creative game ideas. So many fabulous outdoor activities and stories linked at the last outdoor play party. If you were featured this week, go ahead and grab our “Featured at the Outdoor Play Party” button for your site. I love the rock rainbow!